Easy to use on mobile devices: If you can’t get feedback from your customers on mobile devices, then you miss an average 57% of your users. 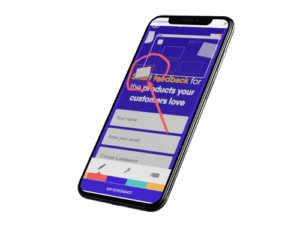 With the new Usersnap Classic widget, your users can take screenshots of their problems with your website or app directly on their phone or tablet screen and annotate, draw and add comments together with their feedback. Platform independent: No need to worry about what operating system or browser your customers are using, our new widget keeps you covered by supporting all major platforms. Get the best screenshots on iOS and Android with our new widget. Fresh design for the widget: We know your website or web application gets a fresh look from time to time, and that is why we made sure that the new Usersnap Classic widget makes it easy to match your new design. You can now customize the colors and feedback fields with ease. Increased speed: Speed is important for every website not only for Search Engine Optimization (SEO), but also for keeping your customers engaged when they give feedback. The accelerated Usersnap widget fits into your strategy to keep your website or web app blazing fast and reactive. Do you want to get fast and clear visual feedback from your testers and customers using the best and state of the art Usersnap Classic widget? If you are like the majority of people, you are probably always glued to your smartphone. People spend more time with their mobile phones than with their laptops. 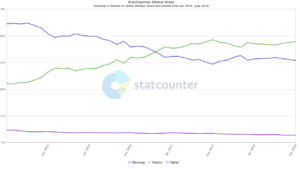 In fact, mobile internet use has already surpassed desktop use. A mobile friendly website is key for the success of your business. Since the rise of responsive web design, it is now easier than ever before to provide a good mobile user experience. However, user experience is not the only thing influenced by mobile design; Google will prioritize your website if you have a mobile-friendly version. And this is the reason you will love the new Usersnap Classic widget on your mobile phone. You can receive up to 57% more feedback via mobile users with the new Usersnap Classic widget (taken from global stats). Why is fresh design so important? Having your own bug tracking tool inside your digital product makes it easier for your users to report bugs and give feedback right where it happens. This is why the Usersnap Classic widget should fit into the design of your website or web app. Great design is important! Design not only helps to attract attention towards your brand, but it also improves the quality of your message. Some studies have shown that people perceive colors in different ways and marketers use that to help deliver quality or a different message. You can also define your own colors in the new Usersnap Classic widget. Why is speed so important for SEO? Google uses page speed as part of its algorithm to rank pages. Additionally, slower pages prevent Google from indexing more pages on your site; since you only receive a certain crawl time budget, this can negatively influence your site’s pages being indexed. Page speed is also an important part of user experience / customer experience. The longer your pages take to load, the higher your bounce rates and average time on page are. Your conversion will drop if the loading time of your pages are slower. You can measure your page speed with Google’s PageSpeed Insights. Update? Is Usersnap available during the update? The Usersnap service is always available for you. That is the great thing about a SaaS product. You can get work done and leave the hassle to us. How can I test the new VERSION of Usersnap? It’s simple: newly registered users get it automatically when starting a free trial. All they have to do is sign up. If you’re already a Usersnap customer, thank you. You can switch manually by going into your Usersnap Classic project settings and turning off the legacy widget. The legacy widget has limited functionalities on mobile devices. We will maintain the previous widget until October 31, 2018. If you have any issues, please contact our customer success team. Don’t hesitate to let us know what you think about the new update. Thank you in advance. Are you looking for a visual bug tracking or customer feedback solution? If you haven’t tried visual bug tracking with Usersnap Classic yet, it’s easy to get started. The first 15 days are on us. Just sign up here and begin your journey toward better product development.